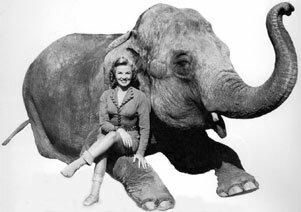 In the serial, “Panther Girl of the Kongo”, Phyllis had to ride an elephant. She told us it was “pretty scary” and when she saw the huge creature she didn’t realize he was actually a very gentle animal. Phyllis, who wore a little short costume, was once on the elephant when she told the director, “Get everything you’re going to get on the elephant today because I’m going to stay up here. I’m not coming down.” She stayed on the coarse haired animal all day! At last dismounting, the inside of her legs were literally raw. “I couldn’t get my legs together. I had to go over to a steam bath in Studio City, they were so sore and stiff. I suspect most of the people who drop into Eddie Rickenbacker’s, a south of Market Street eatery and watering hole in San Francisco, are unaware the establishment is named after the most famous American aviator of World War I. Needless to say, an even smaller number of the clientele know he was also responsible for the creation of a very popular fictional pilot from the comics named Ace Drummond, later the hero of a 1936 Universal 13 episode serial. Still, I couldn’t help but feel, surrounded by numerous photographs of the air ace (not to mention a real bi-plane hanging from the ceiling), I had found the perfect spot to write about this cliffhanger. I dimly recall this serial from my youth—and liking it quite a bit—when a local TV kiddy show host named Fireman Frank sandwiched cliffhanger episodes of serials in between airings of Daffy Duck, Max Fleisher Superman cartoons and commercials for Silly Putty and Mattel Fanner .50s, but I hadn’t viewed it since. 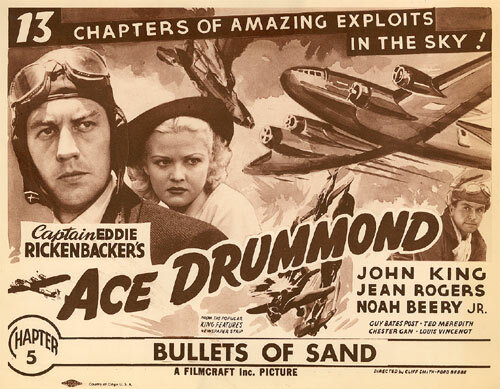 Like a great many chapterplays from the ‘30s, before directors such as William Witney, John English and Spencer Gordon Bennet lent some polish and sophistication to them, “Ace Drummond” can be pretty rough going for modern viewers, even for serial devotees such as myself. Aside from the stiff and labored acting style so common to early talkies, the production values are often crude, the Rover Boys-like dialog hard on the ears and the cliffhangers not always well or believably executed. The plot has an evil mastermind, The Dragon, attempting to sabotage a worldwide clipper ship air concern, his main focus to prevent a Mongolian link. 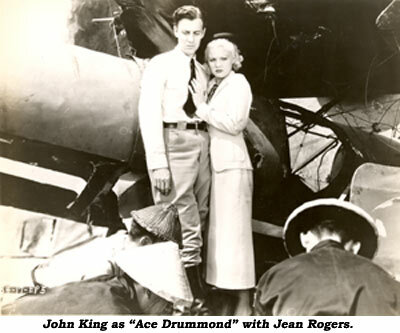 Coming to the rescue is Ace Drummond, an internationally known aviator who also finds time to help the heroine locate her missing father. John King (later “Dusty” King during his days as a B-western performer) as the title character is a good-looking actor, tall and lean in a Gary Cooper mold. His performance as the earnest but likable Ace is serviceable, well intentioned and he handles himself well enough in the action sequences. The most annoying thing about his performance is not his fault but rather that of writers who continually have the one-time band singer warble a corny ditty called “Give Me A Ship And A Song” at the drop of a hat in a number of episodes. 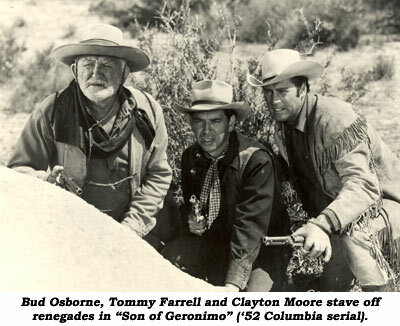 His buddy is the always pleasing Noah Beery Jr., the only performer whose acting style, much to his credit, is relaxed and easy going. Other familiar faces include Flash Gordon’s lovely Dale Arden in the person of Jean Rogers, Montague Shaw, Robert Warwick, Edmund Cobb, Guy Bates Post and Lon Chaney Jr., the latter not altogether believable, to say the least, as a Mongolian henchman. Since this serial is built around aviation, there are quite a few action-packed flying sequences where Ace is placed in serious jeopardy. Although the aerobatics are often impressively handled, our hero too often survives crashes and the like by, well, just surviving—simply walking away from the wreckage with no real explanation. Hardly the imaginative stuff of great cliffhangers. Also, the array of fistfights are the usual ungainly affairs of this cinematic period, a swirling mass of uncoordinated and poorly targeted arms and bodies tussling about in the dirt. “Ace Drummond”, while blatantly dated, technically creaky and a bit silly at times, still has a ring of sincerity about it, a bygone charm mirroring more innocent and romantic times, ingredients that are certainly the staple of all serials. The on-screen printed recap at the start of Ch. 3 of “Ace Drummond” reads, “A clew takes him to the Hall of Dead Kings...” rather than the correct spelling of ‘clue’. “Spencer Bennet, the director, was marvelous. He did a lot of those things. 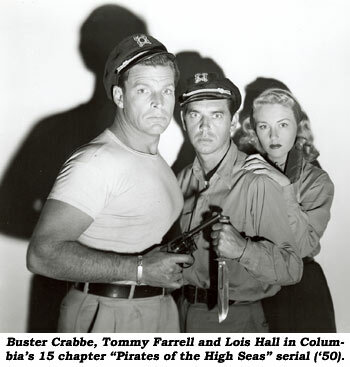 The first one I did was ‘Pirates of the High Seas’ with Buster Crabbe. I was always two steps behind Buster because I was the juvenile. For a young fellow in those days there were only two parts, the girl’s brother or the young deputy. Anyway, Spencer Bennet would say to me, ‘Now you come running down the hill and when you get to the rock you stop and look right and react.’ I was kind of young and dumb and I said, ‘React to what?’ Buster said, ‘Shhhh. Don’t ask.’ ‘What kind of reaction?’ I asked. Buster answered, ‘Do what I do. You look in the direction he tells you and look surprised.’ So I spent three and a half weeks on Catalina running up and down the mountains looking surprised. 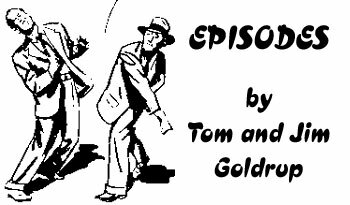 (Laughs) In these serials, Buster always killed a dozen people and I got the hell knocked out of me; I ended up flat on my back every time,” Tommy laughed.